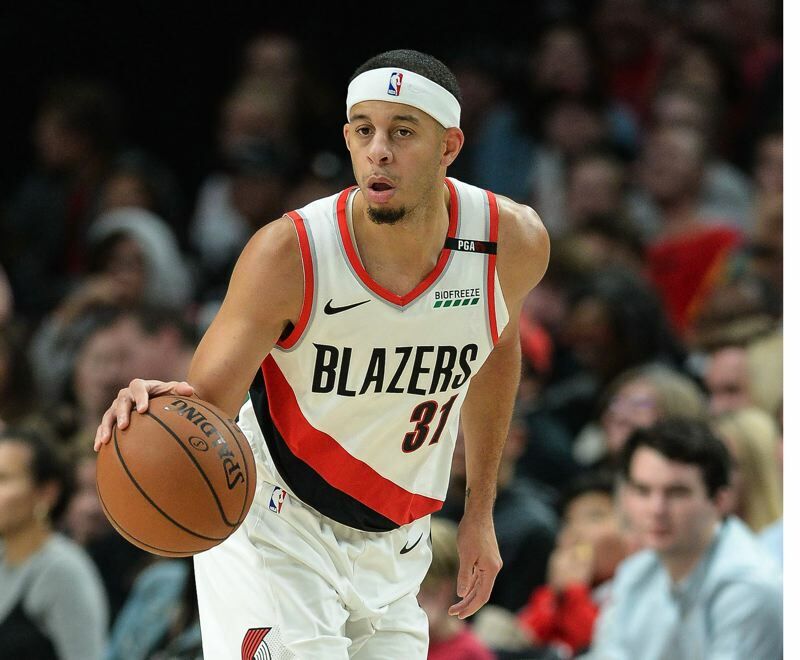 One can only imagine the burden — not ball-and-chain variety, but you get the idea — that Seth Curry has carted around through his life as a basketball player. Son of Dell Curry, sharpshooting veteran through 16 NBA seasons and one of the better sixth men in history. Younger brother of Stephen Curry, five-time NBA All-Star, three-time NBA champion, two-time NBA Most Valuable Player. But Seth has not only survived any pressures familial success has conjured, he has thrived. Look at which brother, for instance, has been leading the NBA in 3-point percentage through most of January. "That's been fun to see," says Dell Curry, now 55 and working as TV analyst for the Charlotte Hornets. "And it's not easy for Seth, when you get only a couple of (3-point) shots a game, to catch a rhythm." Seth Curry considers it a blessing, not a curse, to have had his father and older brother to emulate. "I've had good role models," he says. "I was built for this moment. Being Dell's son, we (Seth and Stephen) had a lot of attention, a lot of eyes on us. The attention was a little more magnified when Steph got to MVP status. I'm proud of what he's done, but I'm proud of what I've done, too." Their mother, Sonya Curry, says Seth has never tried to live up to his brother's success and fame. "It's not affected Seth in the sense that he feels he has to live up to Steph's accomplishments," Sonya says. "One of the things I've loved about their relationship is the focus on always supporting each other. When they can, they'll be in the stands, rooting their brother on. When they can, they'll work out together in the offseason. "There's plenty of competition, for sure. But as a family, we've always skirted any situation where any of our children have had to live up to the other ones, and that's including what Dell did as a player." The Currys are an athletic family. Dell, who spent 10 of his 16 NBA seasons with the Hornets, is a legend in Charlotte, North Carolina. Stephen, 30, is an international icon in his 10th NBA season, bound for the Naismith Hall of Fame. Seth, 28, is on his sixth NBA team in five seasons, but has carved himself a niche. Sonya, 52, was a standout volleyball player at Virginia Tech. Then there is the youngest Curry sibling, sister Sydell, 24, who played volleyball at Elon (North Carolina) University. The Currys also are a tight family. Dell and Sonya were in Portland last week, watching Seth play against Chicago and Charlotte. It was a chance for Dell and Sonya to spend some time with their latest grandchild — Carter Curry, Seth's daughter and first child, who was born last May. Seth lives with his girlfriend (the baby's mother), Callie Rivers, at their apartment in Lake Oswego. Callie is the daughter of Los Angeles Clippers coach Doc Rivers. As children, the Curry boys tagged along with their dad to practices and games, taking the court to shoot beforehand and after when possible, watching intently during. "It was so much fun," Seth says. "Whenever we didn't have school, Dad brought us to team functions, to practices, to games with him. It was great to be around guys like Vince Carter and Muggsy Bogues. "I didn't know it then, but we were soaking in all the NBA knowledge and learning the game and the importance of work ethic. That helped Steph and me to get to where we are today." Dell wasn't a Little League parent, a father who was pushy in working with his kids. "He wasn't a guy dragging us to the gym," Seth says. "If we asked for coaching, he'd help us out. But Steph and I grew up with a love for the game. I was always a kid who wanted to be in the gym working on my game. It was more watching my dad and my brother than asking them questions." "I didn't want to be overbearing," Dell says. "I never had to tell them, 'Guys, go work on your game.' I wanted them to have fun. I just took them with me to practice and worked with them any time I could." Dell saw there was a difference in his sons and the offspring of his teammates. "Before and after practice and games, they were playing around, but you could tell they were paying attention and gaining knowledge, not just from me but my teammates," the senior Curry says. "I had teammates bring their kids to practice and they kind of babysat them. With my boys, when practice started, they'd have a ball in their hands, but they'd sit and watch and pay attention." Dell was an assistant coach on some of the boys' AAU teams and assisted the high school team when Stephen was a senior and Seth a sophomore. "I let Seth do his own thing after that," Dell says. "I stepped away. He was ready to go on his own. As they got older, they needed another voice." Seth and Stephen had their similarities and their differences. "They're alike in they both love the game, and they're sports fanatics," Dell says. "They like a lot of different sports. Both of them are very competitive, and they're both great shooters. But they have totally different games. "As far as personalities go, Seth's a lot more quiet and reserved than Stephen. Seth doesn't say a lot, where Stephen is boisterous and fun-loving. Seth's like me. We can just sit in a room and watch basketball or football and say nothing and be content." "Seth is really quiet, but he can be silly, too," Sonya says. "He was constantly watching Stephen and trying to outdo him, which is typical for the second child. Steph didn't take it easy on him, which was good. Seth would go at him all the time, and they would sometimes fight. They would sometimes get into rumbles on the court. But in general, it was a typical sibling relationship. They were very close." "My mom had to break up a lot of fights," Seth says with a smile. "It was a heated rivalry, playing backyard one-on-one." Being 2 1/2 years younger than Stephen, Seth borrowed from his brother, but didn't copy him. "I watched how Steph played the game and did it my own way," Seth says. "I didn't want him to know this growing up, but I wanted to compete with him. We had a little rivalry. I watched everything he did and put my own twist on it. I learned to shoot and play the game. "Being the younger brother, I had a little advantage. He was always a little better than me, so that pushed me to continue to work and get better. He has been a huge help for me in my career." Did Seth follow the lead of his older brother? "Not necessarily," Dell says. "Seth has always been his own guy. He is proud of his brother and looks up to him, but he understands he has to make his own way. And he took a totally different path to get to where he is today." While Stephen took the NBA by storm rather quickly, averaging 17.5 points for Golden State and making the All-Rookie first team in 2009-10, Seth had a few speed bumps along the way. After one season at Liberty — where he led the nation's freshmen in scoring at 20.2 points per game — Seth transferred to Duke. He started three years and was first team all-ACC and second-team All-American as a redshirt senior. But Seth suffered a stress fracture in his right leg early in that senior season of 2012-13. "We limited my practice time, but I played every game," he says. "Then I had surgery on the leg right after the season." Unable to participate in the Chicago pre-draft camp or in individual team workouts, Seth went undrafted. "And coming off surgery, I wasn't fully ready for the (2013-14) season," he says. Seth was signed by the Warriors but released after the preseason. During that season, he played with the Santa Cruz Warriors in the D-League, had a cup of coffee with the Memphis Grizzlies, was waived, went back to the D-League, was signed by the Cleveland Cavaliers to a 10-day contract, then returned to the D-League. The peripatetic journey continued in 2014-15, when Seth was signed by the Orlando Magic and waived, sent to the Erie BayHawks of the D-League (where he made the All-Star game for the second straight year), was signed to a 10-day deal by the Phoenix Suns, and finished the season in the D-League. After two seasons, Curry's NBA stat line read this way: Four games, 21 minutes, three points. "The hardest thing was not getting an opportunity in the NBA, but basketball-wise, (the D-League) was fun," says Curry, who averaged 21.9 points in 81 D-League games over two seasons. "I got the opportunity to play every night, to get a lot of reps, to work on my game and get used to the NBA system. That benefited me going forward. I appreciated my time in the D-League." Things looked up in 2015-16, when Seth signed a two-year contract with the Sacramento Kings and spent the entire season there, averaging 6.8 points and 15.7 minutes in 44 games, shooting .450 from 3-point range. In his third NBA start in March 2016, he scored a career-high 21 points in a 105-93 loss to the Blazers. After the season, Seth declined a $1-million player option and became a restricted free agent. Curry signed a two-year contract with the Dallas Mavericks and had a good season in 2016-17, averaging 12.8 points and 29.0 minutes in 70 games, 42 as a starter. Included was a 31-point outburst against Minnesota in February. But in October 2017, Seth suffered a stress reaction to his left tibia, which eventually required surgery and caused him to miss the entire 2017-18 season. "He missed a year of competitive basketball," Portland coach Terry Stotts says. "That was a long layoff for him." After signing a one-year, $2.8 million contract with Portland, Seth didn't begin to participate in five-on-five pickup games until late July and even now doesn't feel he is back to the top of his game. "I'm still trying to find my footing," he says. "I'm still getting my legs and my feel for the game back, and trying to be more consistent with my play. I'm still getting my body fully back and strong and where I want it to be. And I'm still learning to find myself in this offense, to find shots. I don't get a lot of shots, so I'm trying to stay engaged in every other way." Through Monday, Curry was averaging 5.9 points in 17.3 minutes while shooting .491 from 3-point range. He is attempting 2.8 shots from beyond the arc per game, fewer than he'd like, though he's not complaining. "It's about continuing to get good shots, not firing them up just to get them up," he says. "It's about shooting shots I know I can make. When I do that, I shoot a high percentage, like I've done my entire career." Oddly, Curry is shooting only .365 on 2-point attempts this season. "Early in the year, I missed a lot of shots I normally make — floaters, easy shots from short range," he says. "I got off to a a bad start. It's nothing I'm worried about. It's not like I'm getting a high volume of attempts. I feel like as I get more shots, (the 2-point percentage) will come up." The Blazers have been pleased with Curry's contributions thus far. "Seth has done a great job," point guard Damian Lillard says. "Scoring off the bench is something we've needed. In a lot of our big games, he has been able to give us that." Curry missed four games in November with a knee injury, which further slowed his progress toward full physical health. He even had two DNP/CD's (did not play/coach's decision) in a three-game period in early December. Since then, he increasingly has been a major force at the offensive end off the bench. "He's a really good shooter," Stotts says. "He has been more aggressive of late looking for his shot. He's a better playmaker than we thought. He shoots it so well from 3, it obscures the fact that he's good off the dribble. He likes to have the ball in his hands. "He's very confident, and he plays with a chip on his shoulder. That comes from the path he has traveled to get here." Though his minutes have gone up over the past month, they are far fewer than the 29.0 per game played a year ago in Dallas — though on a much better team. When he signed with the Blazers, did he worry about playing time behind starting guards Lillard and CJ McCollum? "I didn't," Curry says. "Throughout the course of a season, you need multiple guys to come in and play minutes. I felt I'd be getting a little more time, but I didn't worry about it coming in. "I'm trying to be efficient, to play better as the season goes along. It's a long year. This is a great organization. We're a great team. I've never been to the playoffs. I just want to try to help us get to that next level in the playoffs. One of my goals is to experience the atmosphere of a playoff series." Curry is enjoying life right now with his girlfriend — Callie works from home for Creative Artists Agency, a talent and sports firm based in Los Angeles — and infant daughter. He is "learning on the fly" about fatherhood, he says. "Seeing her grow up every day is a lot of fun," he says. "She is getting more personality. It's a little more hectic at our place, but we're loving it." "I've seen a softer side in my son after having 'CeCe,'" Sonya Curry says. "It's nice and fun and a blessing to watch — how he looks at her, and the pride he has and how he lights up when he's around her." Seth says he has enjoyed the city of Portland so far, in particular the denizens of Moda Center. "Great people out here," he says, "and great fans every night in the arena. There's a buzz at every home game. I'm trying to get used to the culture and everybody here. I'm liking it so far." Curry becomes a free agent after this season, and he would seem in line for a much more lucrative contract. Will he test the market this summer? "I'm locked into this season right now, trying to make the most out of it, and we'll go from there," he says. "I like it here in Portland. I'm just trying to make a big impact on the team moving forward and helping us into the playoffs. A lot can change from now until the end of the season." Seth's parents are proud of the resilience he has shown as he has fought through the adversity of injury and a succession of new teams. "I'm really proud of the way Seth has stuck it out," Dell says. "He went through the D-League, with one goal in mind — to get to the NBA. He took his own path to get there while watching his brother have success really quickly. "He has been dedicated and disciplined on his journey. My wife and I have watched him handle everything very well. It was just a matter of him getting the opportunity." • He has had an endorsement contract with UnderArmour since his rookie year and wears the company's gear from head to toe, following in the footsteps of older brother Stephen. "My rookie year was the same time Steph signed with UnderArmour," Seth says. "It just made sense for me to go with them, too." • He's an outdoorsman, those he's had no time to participate in his favorite pursuits yet in Oregon. "I like to hunt and fish," he says. "I've done some dove and deer hunting." Says his father, Dell Curry: "Steph likes to play golf; Seth would rather throw a line in the water." • Since middle school, he has kept to a regimen of making between 500 and 1,000 shots a day. "It's about form, but it's about repetition, too," he says. "It's more about perfecting the way you shoot the ball." • He has worn a headband since midway through the 2015-16 season with Sacramento. "I wore one and had a good game and told myself, 'I'm going to wear it until I have a bad game,'" he says. "I ended up playing well for a two-or-three week stretch where I had no off nights, and stuck with it."